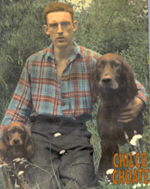 Born in the lower Fraser Valley during the Great Depression, Choate left home at 16 for Chilcotin country and became a big game hunter and outfitter. A critic of B.C. land-use policy, he wrote The Fire Still Burns: A Life of Trail Talk and Contrary Opinions (Heritage, 2001) to discuss the ramifications of vanishing wilderness. He is also the author of the autobiography Born for the Wild Country: Big Feet and a Mouth to Match (Heritage House, 1998) and Unfriendly Neighbours (Caitlin Press, 1997).